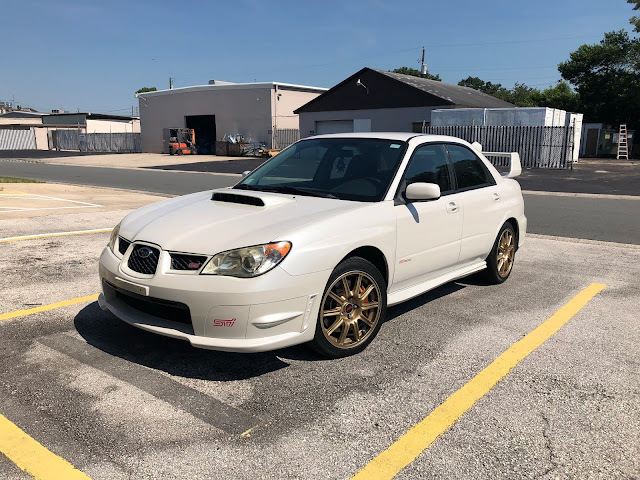 We recently had a client come in to the shop with his really clean 2007 STI. He was complaining about a lack of power, intermittent engine roughness, and boost not building like it had been in the past. We gave him a list of items we could check, and then we set to work to find out what was wrong. It probably isn't what you think! First up was the easy checks - Making sure the coilpacks and all electrical connectors are tight. Then a full inspection to see if we could spot anything that looked out of place. 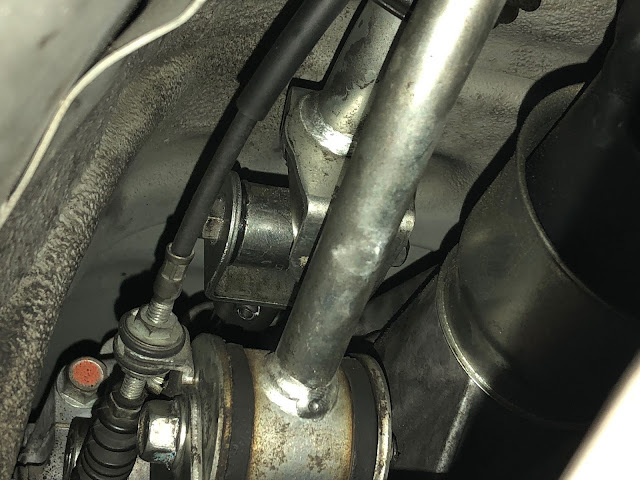 Common issues we see that can cause rough running are loose coil packs, missing grounds, engine harness connection issues and air leaks. Seeing nothing out of place or that looked suspect we moved on to the next test- Vacuum leak test. 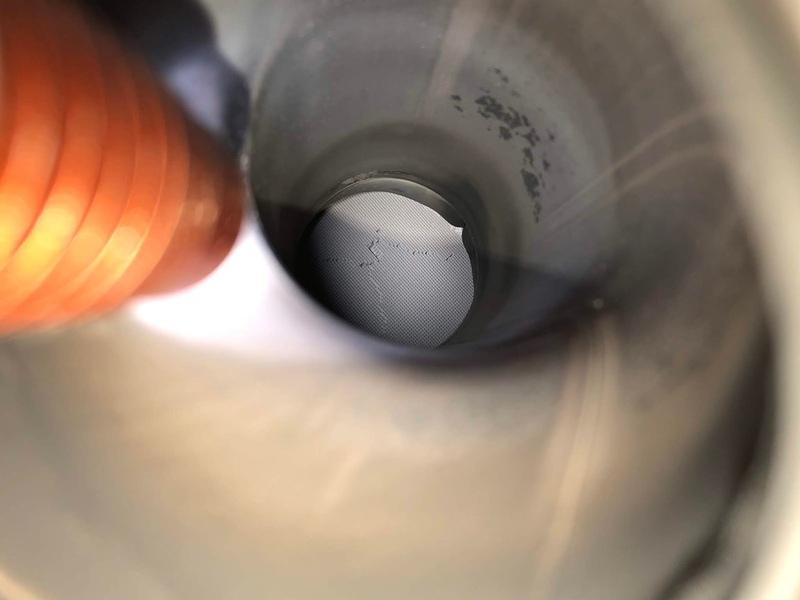 Sometimes called a smoke test, we use a specialized machine that pumps pressurized inert smoke into the intake system. This will very quickly show us if there are any leaks in the intake tract, turbo, evap hoses, vacuum lines etc. It's a very effective tool, and in this case it showed us the car had zero leaks. This 2007 Subaru Impreza WRX STi is basically stock, with a few small mods, but it does have over 111,000 miles on the odometer. So seeing nothing out of place or that looked suspect, and with no air leaks, we moved on to the next test - compression and leakdown of the engine. 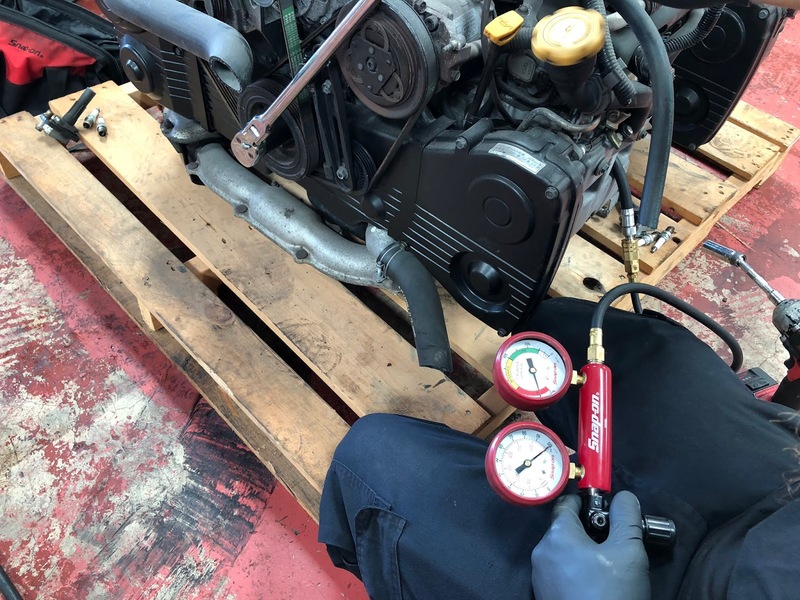 We use this test a lot ensure that an engine is still sealing on both the bottom and top end. This test entails pumping pressurized air into each cylinder, and then checking to see what amount of air that cylinder will hold. 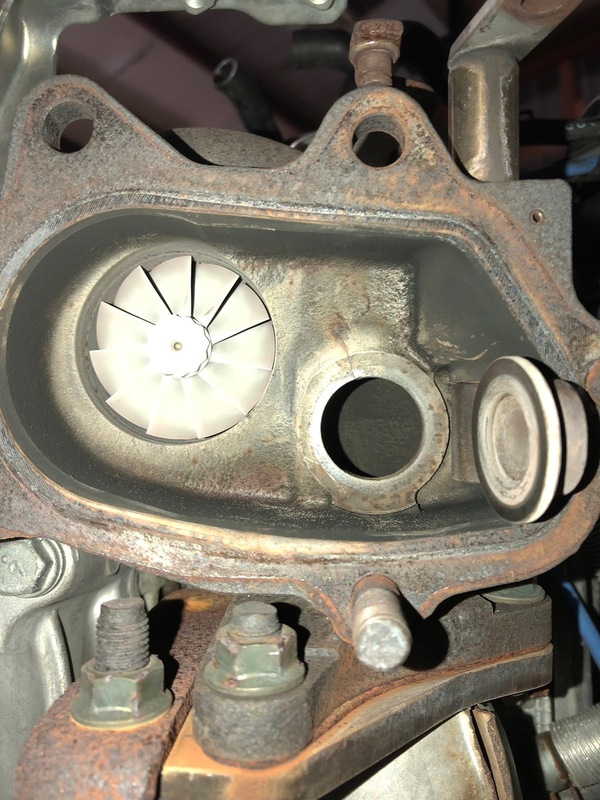 With some experience on what to look for, we can determine if the air leaking out of the cylinder is coming through the intake valves, exhaust valves, or into the crankcase. This will tell us if you potentially have a bad valve, or a cracked piston. 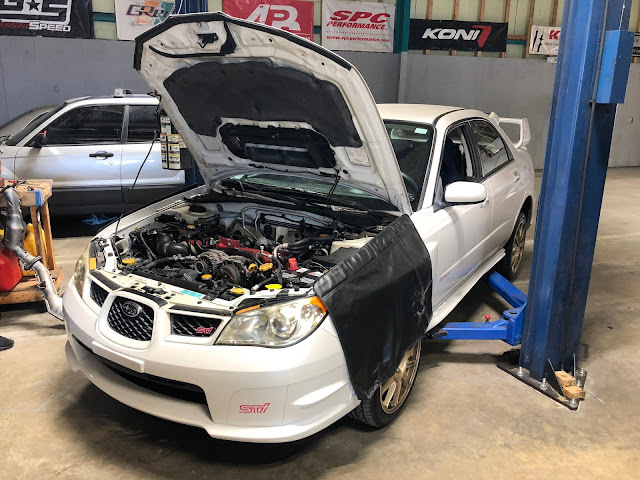 Luckily for this car, the engine checked out great and we installed new NGK spark plugs before we buttoned it all back up. Wastegate crack present, but not terrible. The issue was found inside the downpipe. The stock catalytic converter had cracked and was starting to deform. This can happen with age and excessive heat and we have seen this issue before. 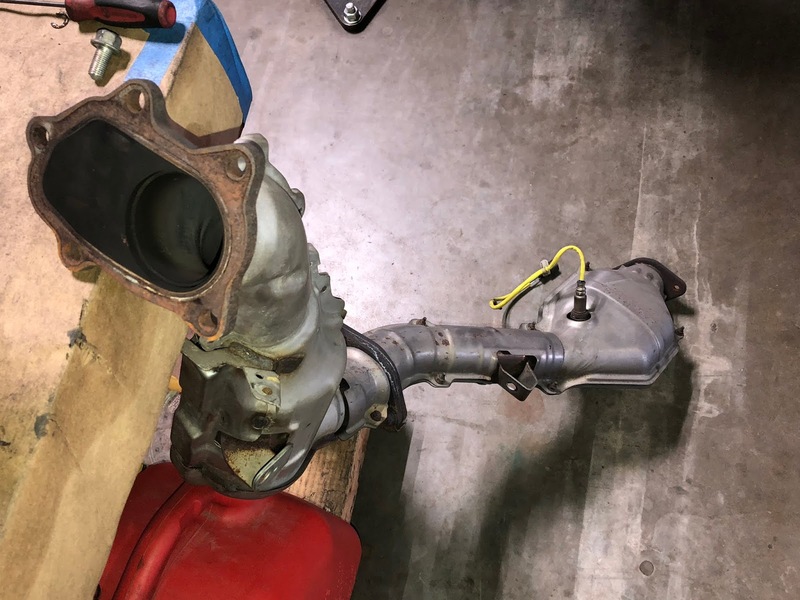 Basically, as the cat fails and falls apart it blocks exhaust flow, this creates a lot of backpressure which affects boost pressure and exhaust gas flow. All of this can add up to lower boost pressure, lower power, and a car that feels sluggish. The simple fix for this is to replace the downpipe with another one, and it's a good opportunity for an upgrade! With that problem solved we moved on to the next item on the list, a sloppy shifter. You can see the cracked catalytic converter down inside the pipe. While under the car we noticed that one of the bushings for the shifter linkage was missing. As the bushings age they fall apart and this creates a lot of movement and "slop" in the shifter action and feel. The fix is to remove the linkage and install new bushings. 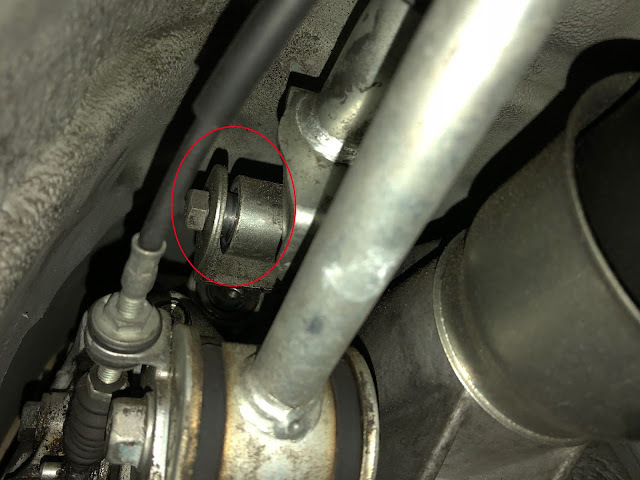 We use Turn in Concepts shifter linkage bushings for the WRX and STI, these are stiffer than stock and provide much better shifter feel and response. While on the lift we also drained and filled both the transmission and rear differential fluid. These are common things to be overlooked when having a car serviced and not only is it important to keep the driveline operating smoothly, fresh trans fluids can also help shifter feel as well! With that done the car was buttoned up and ready to go, with a happy owner knowing his engine was still solid. New bushings isntalled and lubed! 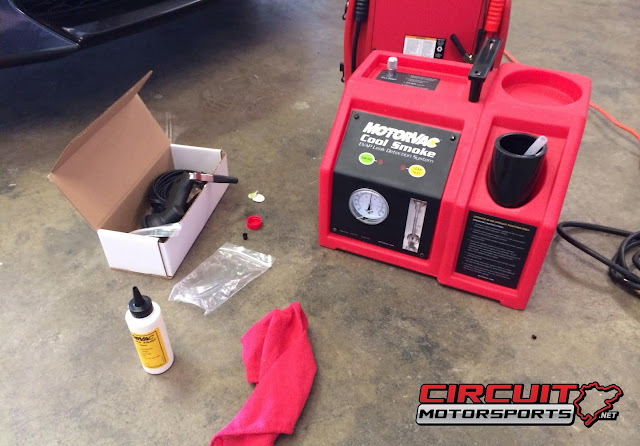 Circuit Motorsports is a performance auto shop located in Orlando, Florida. We specialize in performance upgrades, ECU tuning, engine builds, and fabrication. If you are interested in performance upgrades or a full build consultation contact us today!